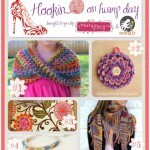 Hookin On Hump Day #42 - Link Party for the Fiber Arts! 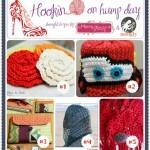 Welcome to Hookin On Hump Day #42! I don’t know how you do it, but each week’s links just get better and better! Amazing stuff, and I’m always blown away and excited to check out your blogs! It’s getting harder and harder for Sara from My Merry Messy Life and I had to figure out who to feature each week! Thank you all so very much for linking up! My Merry Messy Life and Moogly co-host this fabulous link party, and every week we highlight both the most clicked link and those that we feel deserve to be in the spotlight. These links will get twice the exposure – featured on both blogs and on our social media sites, so joining up is a great way to get your site seen. If you’ve joined up before, or if you’re new to Hookin On Hump Day, please take the time to read the link party rules below – they’ve been updated! Now let’s get to this week’s highlights! The #1 Most-Clicked Link: Sweet Little Tunic Dress – Free Crochet Pattern by Ana of Days of Yarning! 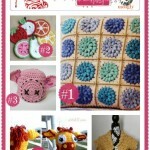 #2 – Little Blossom’s Blanket by Knot Your Nana’s Crochet – This is so well-crafted and really pops! #3 – Honeycomb Pillow Finish by Amy of Sew Incredibly Crazy – Just darling! I love the artistic interpretation of the honeycomb! #4 – Crochet Lamb Hat Pattern by Sarah of Repeat Crafter Me – Sarah’s patterns never cease to disappoint -this one is FREE and includes sizes for every age! #5 – Blue Waves Ripple – Ta-Daah! 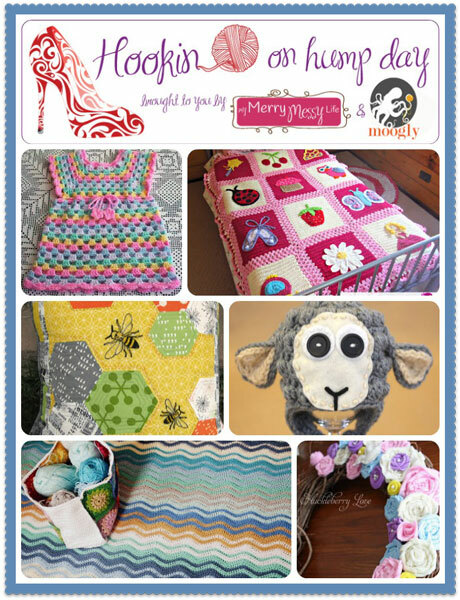 by Rajeswari of Diaper Mum – Gorgeous blanket! I love how the color of each row is random. #6 – Spring Grapevine Wreath Tutorial by Jamie of Huckleberry Love – This wreath is gorgeous! Jamie includes a step-by-step tutorial for making the flowers with felt. Please link your post back to one of the hostesses – Moogly or My Merry Messy Life, or grab the Hookin on Hump Day party button here. Without a button on your site or link back on your post, we will not be able to feature it the following week. I can’t wait to see what you’ve been working on this week! You don’t have to be a designer or a big name blog to join this link party – all you need is to have a post about a project you did that you’d like to show off! You don’t have to enter at both blogs either – an entry on one shows up on both, and the featured links are promoted by both My Merry Messy Life and Moogly! Twice the exposure! Remember, this party is in RANDOM order, so there’s no such thing as being late. New to the Hookin On Hump Day party? To receive reminder emails each week about the party, enter your email here. Otherwise, I won’t pester you if you’d rather not receive a reminder! 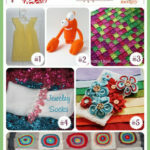 Hookin On Hump Day #40 – Link Party for the Fiber Arts! Hookin On Hump Day #41 – Link Party for the Fiber Arts! Hookin On Hump Day #45 – Link Party for the Fiber Arts! Hookin On Hump Day #44 – Link Party for the Fiber Arts! The blue wave ripple throw is very pretty. I thought that the color of the waves was random also, but there is a pattern there. It’s a different and interesting pattern. Thank you Preeti! I’ll follow you too! I would really like to hook up, but I can’t see how, can you let me know!! Found it !! thanks so much for your help. Thanks Heather – I’m following you now too! How strange! I don’t know why she entered it in the link party – maybe she closed down access afterwards, since this was a very old post. sorry about that!